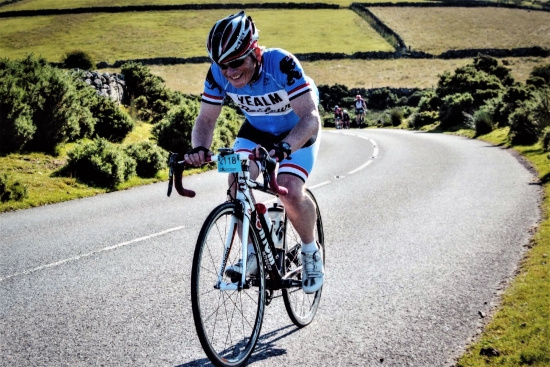 The Dartmoor Classic Sportive, organised and run by the Mid-Devon Cycling Club is widely recognised as the most prestigious open-road cycling event in the UK. Established in 2007, The Dartmoor Classic has grown in popularity, attracting cyclists from around the world. This year, nearly 4000 entries were sold out within hours of tickets being released and Newton Abbot Race course was buzzing for two days as the headquarters and Welcome Village for the competitors, hosting the start and finish lines. The Dartmoor Classic offers a choice of three routes. The Grande (107 miles / 173 km), the Medio (67 miles / 109 km) and the Piccolo (35 miles / 57 km). Roger Punch FRICS, Consultant for Marchand Petit, was taking part in his 11th Grande Classic and his wife Penny completed the Piccolo. Ocean BMW Torbay, one of the sponsors, had a fleet of glamorous cars leading out the competitors in waves of staggered start times, from 6 am to 10 am. Dartmoor Search and Rescue Team (Ashburton) ran the official Dartmoor Classic Prize Draw and attractions included live music, catering, entertainment and a range of exhibitors present at the Welcome Village for the enjoyment of participants and their families. For further information please contact Marchand Petit’s Newton Ferrers office on 01752 873311, email: newtonferrers@marchandpetit.co.uk.